Legacy retailers’ ongoing struggle to stay relevant in a landscape increasingly dominated by Amazon and online upstarts has come to a head in the past year. 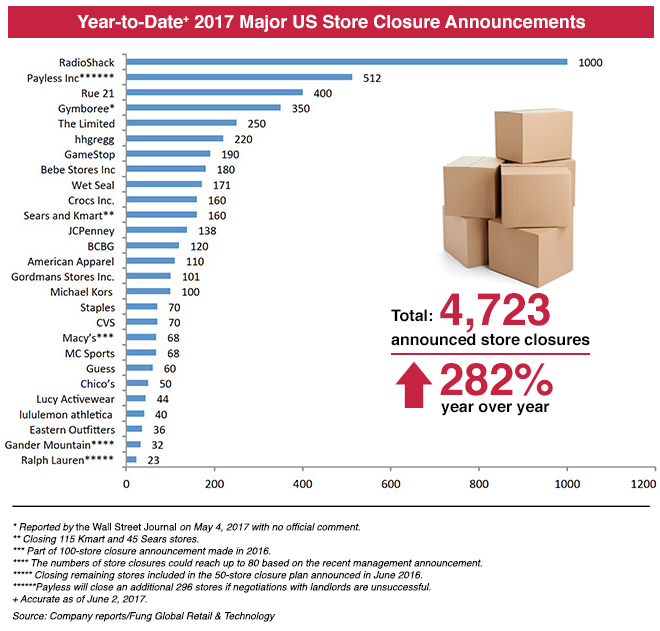 Companies will close thousands of stores this year – and some may not survive at all. While it may seem that retail is headed for an apocalypse dominated by dead malls, in reality it’s a needed industry shakeout. At the recent Retail East Summit in New York, Ask, Avon director of digital strategy and e-commerce Sapna Shah Parikh and Shyam Gidumal, leader of EY’s consumer products and retail market segment, discussed where retail is headed next and what the landscape might look like in the next decade. The conference was organized by Knowledge@Wharton and Momentum Event Group. Retailers including The Limited, Bebe, Wet Seal and hhgregg shut down for good this year. Michael Kors, Payless ShoeSource, Sears, J.C. Penney, Macy’s, Abercrombie and Fitch and others will close dozens – in some cases, hundreds — of stores in 2017. Over Memorial Day weekend, Radio Shack closed more than 1,000 stores across the country. The company once had over 7,000 stores; now, just 70 corporate-owned stores and 500 dealer stores are left. Levi Strauss’s Ask noted that the U.S. has as much as five times more retail square footage per person than that of other developed countries, leaving it with an unviable store footprint. While many of the current doom-and-gloom headlines are more about industry retrenchment than an outright death for traditional retail, she said that brands will not survive if they don’t find ways to transform the customer experience. Although most retailers know they need to transform, few are confident in the exact path forward. Parikh said that there are a couple of key truths that retailers need to face as they find a way to change course. Number one: The industry “missed the boat” in understanding the impact of Amazon. A single destination that houses all product information so every point of distribution has the same information. An integrated cross-channel strategy for contacting customers. Walkthroughs: Ask pointed out that marketers used to do store walkthroughs prior to seasonal launches. She said the practice should be revived to make sure that campaigns are cohesive across all channels. Gidumal said cost is often one of the biggest obstacles to bringing all the pieces together. “The cost that comes with retooling is so meaningful and the benefit is aspirational,” he noted. The second is analyzing what capabilities need to be built and what the benefits are likely to be by channel. Finally, Ask said they discuss what it would take to build the tool or system so it will be dynamic and can be turned on and off so the company can analyze the costs and benefits through every layer of the marketplace. “It gets to be a really fascinating way of thinking about an idea; it shatters the idea of a digital arm of the organization because it forces all of us to think digital,” she noted. Parikh said Avon has tried to break down siloes by keeping the focus on Avon representatives and how different systems can make it easier for them to sell to their customers. “Understanding the end consumer has helped us to raise the bar for representatives in their entrepreneurial activities,” she said. “Because of advancements in AI and social media data, we’re able to connect them better with potential customers and empower them with data they need to help sell. But she noted that while U.S. retail is overburdened as a whole, plenty of individual brands are not, and many individual shopping centers are still growing their traffic. The differentiator, Ask added, is often which brands or developments are creating unique experiences for customers. That trend toward the experiential is also what Ask named as one of the drivers of successful retail in the future. “From now on, there is no day off, no downtime; consumers are on all the time, and so should we be,” she said. “We’re not just competing with other retailers and other brands. We’re competing for what consumers want to spend money on.” She noted that the U.S. apparel industry last year grew 3%, while the U.S. domestic travel industry grew 5%, and there are seven million more cruise passengers today than there were 10 years ago. Ask imagined a consumer visiting the Coachella music festival and “checking out a trucker jacket or denim shorts and being able to take a photo of them and find out what it is, where it is available near them and choosing to ship it to their house or to get it in a store.” She noted that the latter is more cost-effective from the retailer’s standpoint. “So how do we make it so compelling that they want to go to the store because of the benefits?” she asked. NATO’s purpose, in the blunt phrase of its first secretary general, Lord Hastings Ismay, was to “keep the Americans in, the Russians out, and the Germans down.” But Germany no longer needs to be kept “down,” and there is some debate whether Russia should have been kept “out” after the collapse of the Soviet Union. And Trump is right about one thing, even if he expresses it crudely: Europe, as well as Japan, has become too dependent on American military power. This dependence on the US for collective security does not make American allies exactly into colonies. And the US is not formally an imperial power. But aspects of a common late imperial dilemma are visible in both East Asia and Western Europe today. If the US were to give up its leadership role too quickly, chaos might follow and less benign powers might jump into the vacuum. But if the US-led system remains in place for too long, it will prevent American dependencies from taking more responsibility for their security. When imperial arrangements are dissolved, violence often results. The Armenian genocide accompanied the demise of Ottoman power. Murderous anti-Semitism and radical nationalism followed the fall of the Austro-Hungarian Empire. Something similar happened when Josip Broz Tito’s little Balkan empire of Yugoslavia fell apart. More than a million Hindus and Muslims lost their lives in horrific sectarian violence when the British Raj left a partitioned country to its devices. This is not an argument in favor of imperialism. But the age of Trump should make us ready to face the consequences once the US-led post-1945 order comes to an end. American leadership has obviously been a flawed enterprise, resulting in unnecessary wars, and the support of too many unsavory allies in the struggle with Communism. But there have been many positive factors, too. Western Europe, Japan, and even, belatedly, South Korea and Taiwan, were able to become free and prosperous under the protection of the US. Despite the excesses of anti-Communism, US dominance has also acted as a brake on ideological extremism. Neither Communism, nor variations of fascism, or indeed radical nationalism, had much of a chance to develop in Europe under Pax Americana. Recent elections in the Netherlands and France suggest that Trump may be serving as a deterrent, rather than a boost, to populist extremism in Europe. But if the populist wave were to become bigger and more brutal, there is nobody in Washington now to discourage it. In Japan, dependence on the US, and anxiety about Communism, has marginalized the left and kept a conservative party more or less permanently in power. But the extremes of Japanese revanchism were also kept in check. This may no longer be so easy, once the US is no longer seen as a reliable protector and fear of China turns into a panic. Unlike some of her predecessors as Chancellor, Merkel, who grew up in East Germany, is wary of Russia’s strategic designs. There is no doubt that Russia and China will benefit, at least in the short term, from America’s abdication of leadership. Some people are not too bothered by this. Russia is closer to Berlin or even Paris than Washington or New York. There is a great deal of money to be made by cozying up to the Russian and Chinese regimes (as the US president knows only too well). And the chance that either Russia or China would invade NATO countries or Japan might be slim. But there will be a price to pay for increased vulnerability to Chinese and Russian encroachments. No matter how irksome American dominance might have been, or how much people deplored some of the destructive wars that the US unleashed, criticism of US policies, presidents, and even cultural practices was not only permissible, but seen as a healthy sign of liberal democracy. This was one of the “common values” that held the West together. The same will not be true in a world dominated by China. Criticism will quickly lead to repercussions, especially in the economic sphere. Hollywood studios are already censoring the content of movies expected to make money in the Chinese market. Western news media, eager to maintain access to Moscow or Beijing, will be under increasing pressure to be careful about what they print or broadcast. This will hurt our own societies, which are built on the principles of openness and freedom of expression. So even if the end of Pax Americana does not result in military invasions, or world wars, we should ready ourselves for a time when we might recall the American Empire with fond nostalgia. 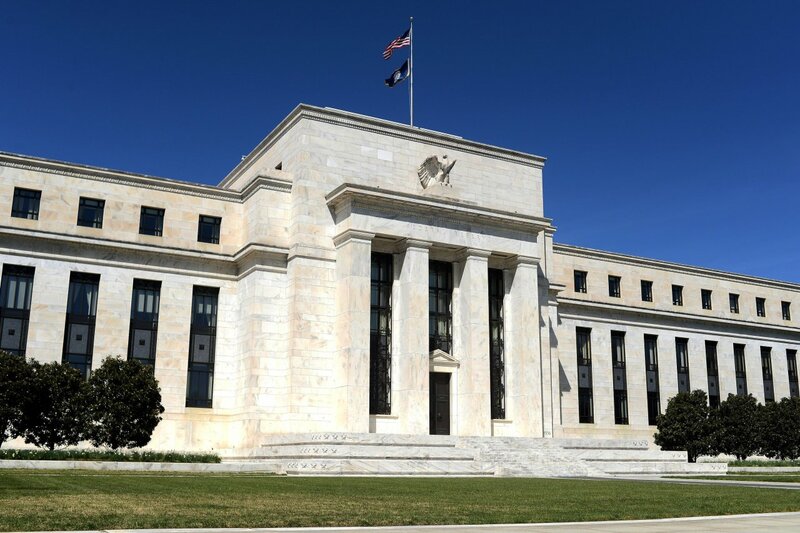 Inflation is cooling again, and the Federal Reserve hopes that is only a temporary thing. What if it isn’t? One of the Fed’s aims is to get inflation up to 2%, a rate that it believes minimizes the risks of the economy overheating or stumbling into recession. So it counted as awkward when the Federal Reserve raised rates on the same day the Labor Department reported that inflation continues to cool. Consumer prices edged lower last month, the Labor Department reported Wednesday, driven by a decline in gasoline prices. Core prices, which exclude food and energy items to better capture inflation’s trend, came in weak for the third month running, and were up just 1.7% from a year earlier. That implies that the Fed’s preferred measure of core inflation was up just 1.4% on the year, according to J.P. Morgan ’s calculations, which would mark the slimmest gain since late 2015. The Fed, in announcing its rate increase, indicated a bit more concern about the cool-down, specifying that it is “monitoring inflation developments closely.” Policy makers also lowered their inflation projections for this year. But the projections also showed policy makers still expect to raise rates once more in 2017. Additionally, they expect to start shrinking their balance sheet this year, which in effect will make monetary policy tighter. Part of why inflation is so low is that wage growth, despite the low unemployment rate, has been weak. The Fed is working under the assumption that the tight labor market will eventually flow through into faster wage growth. But as Fed Chairwoman Janet Yellen pointed out in the press conference following the Fed’s meeting, inflation may be less sensitive to unemployment-rate declines than in the past. There are some one-time changes in prices weighing on inflation—Ms. Yellen noted cellphone service pricing—but the weakness has occurred across enough categories that it is hard to deny that overall inflation has weakened. Scars consumers still carry from the financial crisis may be playing a role, as might the ease with which technology allows people to ferret out bargains. Whatever the reason, just as the economy remains in a slow-growth rut, inflation might be stuck below 2%. Investors are betting that is the case. The yield on the 10-year Treasury fell to its lowest level since November and the dollar is at its lowest level versus other major currencies since October. If so, today’s low inflation readings shouldn’t be read as a sign that deflation risks are elevated, and that the Fed ought to counter them. But at the same time, they call into question why the Fed thinks it is a good idea to keep on raising rates. The economy is cool enough already, and the danger is that the Fed will only make it colder. U.S. President Donald Trump's withdrawal from the Paris climate accord marks an epochal shift. With the America no longer reliable, it is time for Chancellor Angela Merkel to look for new partners. The American withdrawal from the Paris Agreement on climate change marks a historical turning point. Despite all the warnings from his closest advisers, Donald Trump on Thursday turned his back on the consensus of our world's largest nations and essentially declared the battle against climate change to be over. For Angela Merkel, who has placed climate issues at the center of her tenure as German chancellor, it isn't just an affront, it is also a personal defeat. No other international project has been as important to her as that of limiting global warming to 2 degrees Celsius. At the G-7 summit in Taormina last week, Trump had already dropped dark hints about his upcoming statement on the Paris Agreement. Only with great effort were Merkel and the other heads of state and government able to avoid a public embarrassment. And only afterwards, in a Munich beer tent last Sunday, did the chancellor indicate what she really thought of Trump's performance. "The times in which we could completely rely on others are over to a certain extent," she said. Merkel's speech was essentially a preliminary commentary on Trump's climate decision. In both Europe and the U.S., her sentence about America's limited reliability was interpreted as the end of an era: Since 1949, all German chancellors have placed their faith in the alliance with Washington. For 68 years, the U.S. was seen as a reliable partner to (West) Germany. In truth, though, the chancellor has only lost faith in one person, in Donald Trump. And rightly so. Just because the U.S. is currently being led by an inadequate president shouldn't mean an end to the trans-Atlantic alliance. The relationship between Germany and America is so tight that not even someone like Donald Trump can -- or should be allowed to -- ruin it. Merkel could have said as much herself, but with the German campaign heating up, she too prefers a more pugnacious tone. Such comments may not be as abrasive as those consistently emanating from the White House, but they are undiplomatic. She is clearly willing to risk a bit of scandal to win over a few more votes from the steadily growing number of America-skeptics in Germany, particularly because it helps her withstand the Trump bashing coming from her political adversaries on the center-left. But Trump, too, profits from such conflicts -- strife is his preferred political method. His withdrawal from the climate agreement provides an example: The more the world criticizes Trump for his climate change denials, the more his supporters worship him -- as the great, courageous warrior against the political elite on both sides of the Atlantic. He likely knows himself that the coal mines still don't have a future in the U.S. But he has, for the time being, served his clientele. And the president likely didn't believe his own announcement on Thursday that a new climate agreement would be negotiated. Why should the rest of the world be interested in spending years negotiating a climate deal that is even weaker than the Paris Agreement already is? The rift with Trump is just the latest in a long string of foreign policy failures that Merkel has suffered during the 12 years of her tenure. Putin's Russia is once again seen as an adversarial power, civil war continues in Ukraine, Turkey is on the path to a dictatorship, the United Kingdom is leaving the European Union, Hungary and Poland are taking a step back, Greece is endangering the euro -- and now even the U.S. is turning into a problem child. Germany is running out of partners. The chancellor should treat the ones that remain with care. In contrast to her predecessors in the Chancellery, who tended to seek out contemporaries with whom to tackle the political problems of the day, Merkel is skeptical of political friendships. Helmut Schmidt partnered with Valéry Giscard d'Estaing, Helmut Kohl with François Mitterrand and Gerhard Schröder with Tony Blair. Merkel, though, has never constructed such an axis, and doing so with Trump is an impossibility. In her speech last Sunday in Munich, Merkel at least drew the correct consequences: "We Europeans," she said, "must really take our fate into our own hands." Perhaps she was referring to Trump's demand that Germany boost defense spending. But the European project won't be saved with tanks and warships. If Angela Merkel really wants to do something to stop the erosion of the EU and to save the Paris Agreement, she must form an axis with French President Emmanuel Macron -- one that is based on personal trust. Macron's proposals for united European financial policy might be ambitious, and they might cost the Germans a lot of money. But the chancellor should embrace them nonetheless. Helmut Kohl invested billions in European unity -- and it has been nothing but beneficial to us Germans. Today marks the 75th anniversary of the end of the Battle of Midway. The books and movies about this battle have been legion. They focus on the long odds facing the Americans, the luck and breathtaking courage, and the brilliance of American codebreakers that led to victory. They assert that the American victory sealed Japan’s fate in World War II. But they rarely consider in detail the consequences if America had lost the battle, which it might easily have done. The Japanese were also extraordinarily courageous. Had they been luckier, and had they changed the Japanese code well before the battle as they should have, Midway could have ended in the destruction of three American carriers, with the Japanese navy intact. On this anniversary, I want to consider the war had the battle gone Japan’s way. The immediate consequence of a defeat at Midway would, of course, have been in the Pacific. The Japanese plan appears to have been to follow Midway with an assault on strategic islands in the South Pacific. They would have faced light forces on the islands and no naval threat. They would have taken islands, built airfields and constructed overlapping areas of air power that would have prevented merchant shipping from entering. The flow of U.S. troops and materiel to Australia would have slowed to a trickle or dried up altogether. This would have meant that the U.S. would not have taken Guadalcanal and New Guinea until much later. It also would have given Japan much more time to consolidate a line, for example, from Samoa to Midway to the Aleutians, which was also part of Japan’s Midway strategy. The United States, lacking a sufficient carrier force, would not have been able to launch a Pacific offensive until mid-1943, and that offensive would have had to be focused on the South Pacific rather than the Gilberts, Marianas and Marshalls. The cost in time, men and materiel of bringing Japan into range of American bombers would have been substantial. Submarines would have had to launch from Pearl Harbor rather than Midway, which is 1,300 miles (2,100 kilometers) longer, and much of the time would have been spent on submarine operations to interdict supplies instead of attacking Japanese warships. Japan would have had time and materiel to increase its strength. The Americans’ problem in the Pacific would have been securing Hawaii as a forward base and maintaining the line of supply from the West Coast. The Japanese were unlikely to invade Hawaii, given that all operations there would take place within the range of U.S. air power. But the Japanese could have used submarines based in Midway to interdict supplies from the West Coast. If Hawaii ceased to be an effective base, then the Japanese would dominate the Western Pacific. They would have had options to strike the West Coast, and certainly to take Dutch Harbor in Alaska or even Anchorage. They already held the islands of Attu and Kiska. The Americans would have had to answer. In 1942, the Battle of the Atlantic was at its peak, and that summer and fall, an extraordinarily high 10 percent of all Allied shipping in the Atlantic was being sunk. It is at this point that the United States would have had to decide whether to risk the isolation of Hawaii or reduce the number of destroyers based in the Atlantic. It couldn’t do both – U.S. production of naval vessels wouldn’t really be able to surge until mid-1943. The shipping of supplies to Britain was meant to support Britain and the Soviet Union, an excellent long-term strategy for pursuing American interests. But this was a political problem. The immediate threat to the American homeland would likely trump long-term strategy. Given the stakes in the Pacific, the odds against U-boats in the Atlantic and the delay in increased production of naval vessels, the U.S. would have had little choice but to transfer destroyers to the Pacific. But that wouldn’t be enough. It would also greatly increase land-based aircraft on the West Coast. The aircraft production program was beginning to gain steam in 1942, but most of that at the time was being assigned to the Royal Air Force, the U.S. Air Force buildup in Britain or the Soviet Union. That would have changed. We must consider the impact of all this on Allied powers. Australia would have depended on its own resources. The Japanese were unlikely to invade, but the Australians couldn’t be sure of that. For things to change, the U.S. would have to launch a new Navy, fight its way through the South Pacific and then launch operations northward to push the Japanese away from Australia. To that point, neither the British nor the Americans appeared very effective allies. At the very best, the U.S. was a year away from offensive operations, and opening the line of supply to Australia might not happen until 1944, if ever. Immediately upon the U.S. defeat at Midway, Australia would have had to demand that the last Australian forces in North Africa return home while the Suez Canal was still open. The battle of El Alamein was being fought from summer 1942 until the British victory in October. A British defeat would have enabled the Germans to take the Suez Canal and likely control the Mediterranean. Australian troops had been critical to this victory, and though the Australians had withdrawn many troops after Pearl Harbor, the 7th Division remained. The 7th Division proved to be the critical force in the final, victorious phase of El Alamein. Had the Australians withdrawn the 7th in summer 1942, which they would have had Midway been an American defeat, it is altogether possible that the British still would have won at El Alamein, but it would have been substantially less likely than with the Australians there. But the homeland would have to take precedent. The Australians wanted to be certain that Australia was not occupied by the Japanese, but they had no military way to prevent it and no reliable allies. Their national strategy was hoping the Japanese had other plans. The Japanese had no real interest in Australia except for making sure it didn’t become a base for the Americans. The Japanese also wanted Australia’s raw materials. A peace agreement was possible. Australia, isolated and with no options, would have done what was unthinkable before Midway: signed a friendship pact with Japan guaranteeing neutrality, with a mutually beneficial trade agreement included. At about the same time of Midway, the Germans launched an offensive in the south that would evolve into the Battle of Stalingrad. The offensive surprised the Soviets, who were expecting the assault to come on Moscow. The Soviets had also underestimated Germany’s strength. At the same time, the Soviets would have seen the American defeat at the Battle of Midway and understood that it would mean a decrease in lend-lease, if not its complete disruption. The British, who also depended on lend-lease, would be in no position to replace it, and Soviet industrial production was not yet capable of providing for a powerful defense at Stalingrad by itself. And the Soviets had a second problem. Prior to Pearl Harbor, the Soviets had feared, and the Japanese had considered, an alternative strike into Siberia. Russia’s maritime region had oil, and Japan needed oil. The Japanese attacked south toward the Dutch holdings instead, but the interest in Siberia was still there. With a victory at Midway, the Japanese could have halted operations in the Pacific and focused on building defenses on Pacific islands that would bog down the American counterattack in mid-1943 in island-to-island fighting, with a vast Japanese fleet to challenge the landing party. But Siberia was open. Right after Pearl Harbor, the Soviets shifted to Moscow the force that had been protecting Siberia from Japan. It was this force under Gen. Georgy Zhukov that stopped the Germans. A Japanese victory at Midway would have reopened the possibility of a Japanese invasion. But the Soviets would not have been able to send Zhukov back. Until the defeat of the German southern thrust, which would happen in early 1943, everything had to go there. The Soviet Union faced two problems. One was that it didn’t know that it could win at Stalingrad with the absence of lend-lease shipments. The other was that critical Soviet lands were at serious risk. If the Soviets couldn’t contain the Germans’ southern thrust, the best they could do was retain a rump state in the north. If they won but Japan attacked Siberia, they would still have lost the east, and the Japanese would control the Western Pacific, China and Siberia. In 1943 and 1944, there were discussions between Germany and the Soviets on a peace agreement that never worked out. I don’t know that either side took these talks seriously. The Germans certainly wouldn’t have considered talks had Japan won at Midway, forcing the U.S. to shift its grand strategy away from the Atlantic, putting lend-lease in jeopardy and exposing the eastern Soviet Union to Japanese attack. I think without the assistance of the Americans in 1942, the Soviets would have lost the war. In our alternate history, the Americans probably would have thought the Soviets were going to lose anyway, but history proved them wrong. It is true that in the years after Midway, American productivity would grow to be enormous, but the enemy doesn’t wait for production to rise. Adm. Isoroku Yamamoto’s intention was to destroy the U.S. naval force in the Pacific and to create an impregnable belt of islands to block American advances. That was the purpose of Midway, and had it worked, I think there would have been a different outcome in the global war. This is because the United States was the industrial foundation of the Allies, but in 1942, that production had not really gotten underway. A defeat at Midway would have forced a reallocation of industrial production and warships. This would have left key allies, Australia and the Soviet Union, in an impossible position. The U.S. would have had towering production by 1943 or 1944. But the Soviets would not be there anymore. Nor, I suspect, would Australia. Britain would have made it so long as it won at El Alamein without Australia’s help. The problem was that massive production without Allied forces and forward bases would have left the U.S. fighting alone. And given the distances and multiple enemies, that wasn’t possible. This all raises a serious question for me. My work is in finding the order and predictability in history. There was nothing predictable at Midway. The Japanese should have won even with the U.S. breaking their code. The numbers were so lopsided in their favor that their defeat was a freak. And that freak created the world we live in. The Japanese were as brave and as smart, their weapons as good if not better, and they had far greater numbers. They should have won, and the things I have described should have happened, and the history of the world should have been quite different.